Boots Washer - Paionia Furyokuki Co.,Ltd. By simply walking slowly through the special revolving brushes, the “Boots Washer” is able to clean the entire boots including the sole with water. Sterilization is also possible by adding a suitable amount of sodium hypochlorite to the washing water. 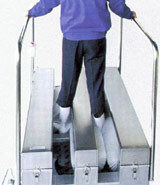 This can be used in a wide variety of areas including food processing plants. 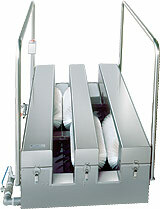 With a compact size that does not take up space, this can be installed in confined locations as well. Other models are also available upon request. Please send your enquiries here.